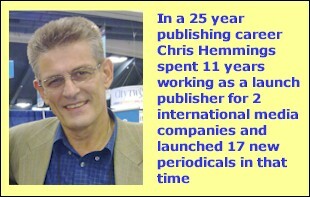 Chris Hemmings, founder and CEO of Internet Publisher, has a long background in periodical publishing stretching back to 1975. Starting his career selling advertising for his local newspaper, Chris went on to specialise in industry and consumer publishing in dozens of vertical publishing markets around the world. During his career as a publisher, Chris has launched weeklies, monthlies, bi-monthlies quarterlies and annuals in several different local, regional and global publishing markets. As a launch publisher, Chris has extensive experience in researching new publishing markets, writing and budgetting publishing plans, setting up new titles, recruiting and training publishing teams, and seeing through publication launches to their final conclusion of a strong readership, quality content, professional team, and a healthy bottom line. 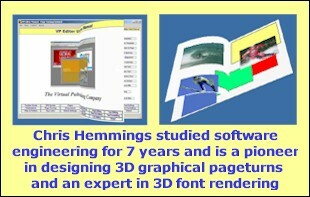 Chris has filed 5 new patents for publishing technologies and in 2008 was granted a US patent ‘3D Publication with PageTurn (Patent No. 7315312)’, a 3D publication interface. In Internet Publisher Chris brings with him experience in publishing markets such as travel, tourism, aerospace, defence, real estate, insurance, jewellery, media and advertising, home decor, lifestyle, medical and men and women's magazines.